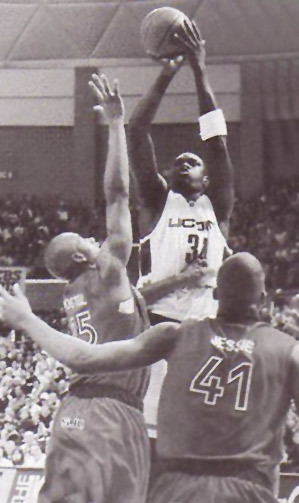 Souleymane Wane was a Center for the UConn Huskies from 1997 – 2001. He was a player on the first UConn National Collegiate Athletic Association Championship Team in 1999. I had the pleasure of talking to Souleymane in October 2006, about his basketball experiences, his time at UConn, and he shared some post-collegiate experiences. Souleymane grew up in Senegal, Africa where the primary sport to play is soccer. It wasn’t until he was 19 years old, when he came to the United States, that he played his first year of organized basketball. With his size of 6’ 11” and 250 lbs, a basketball coach’s dream, a friend of his from the U.S. was able to help Souleymane arrange to come to the States to play basketball. Soon he was enrolled at Redemption Christian Academy, a prep school in Troy, New York where he began learning the fundamentals of basketball, and the English language. Souleymane’s first year at UConn wasn’t easy. With his English not being that good, his attempts through the first semester to score well on his Scholastic Aptitude Tests (SAT) were unsuccessful. Discipline for not reaching a minimum score is not being eligible to play in basketball games for one year making him ineligible until the end of the following fall semester. He was able to take classes, and practice with the team, but not play in games. 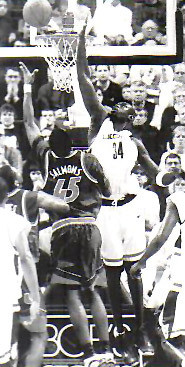 In his first collegiate basketball appearance in December 1997, Souleymane was impressive with five points, eight rebounds, and three blocks in 15 minutes. That season continued to go well for him both on the basketball court appearing in every game after becoming eligible, and academically being named the Team Scholar-Athlete of the season. The following year—his junior year, and second year on the team—Souleymane enjoyed being a member of Uconn’s first NCAA Championship Team. “It was great. I got to play with some of the best players; Richard Hamilton, Jake Voskuhl, Kevin Freeman and others.” Other highlights while playing at UConn were playing at Madison Square Garden, and winning the Big East Tournament Championship. Souleymane enjoyed his experience at UConn but felt he could have done better under different circumstances. “I didn’t really play the way I wanted to play because I had the language barrier, the culture was different, and being so far away from my family were all adjustments I had to make. I wish I had the mindset then that I have now.” He remembered Coach Calhoun had told him that he would be a better player when he was older, and although he didn’t understand the meaning then, he does now. Academically Souleymane was very successful at UConn earning Bachelor’s Degrees in Political Science and French. During the following summer after graduation, Souleymane had several National Basketball Association teams interested in him, and he played well during a basketball camp with the Los Angeles Clippers. Prior to finishing the camp, Souleymane was told by his agent that there was a good basketball opportunity in Bosnia that he should pursue so he did. His first year, post UConn, was playing in Bosnia where he said it was cold and quiet. The following year he played in Japan where the game was more of a running game because they played with a lot of small guys. His next stop was in Poland where he was awarded Best Big Man Honors followed by a stint in Germany where Souleymane experienced being a part of another Final Four, and second Best Big Man Honors. He said he was very comfortable playing in Germany where the style of basketball is most similar to how it’s played in the U.S. This past, and most recent season Souleymane has not been playing basketball due to knee and hip problems resulting in two surgeries, but he hopes to get back to Germany and basketball soon. Souleymane hopes that some day his family will be able to come from Africa for a visit to the United States, but until then he tries to get back home each summer. When not playing basketball in Europe, Souleymane resides in Massachusetts with his wife, Deborah, whom he met at UConn. Souleymane ended our conversation saying, “I had a great time while at UConn. Everything was memorable. Every day was a blessing. UConn was one of the greatest basketball teams in the country so being a part of that was really great."